For TruHorizon, a high standard of environmental safety is a prime objective for our culture, led by our senior management team. Our crews are all TruHorizon employees — not 3rd party contracted labor — who are fully trained in safety and embrace our core values. 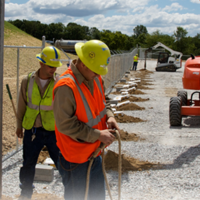 To continually advance our environmental safety record, TruHorizon employs full time HSE personnel who are dedicated to workforce training and performing job site inspections. By bringing extensive knowledge of compliance regulations and technical expertise, TruHorizon ensures customer environmental compliance and also advocates on their behalf to the municipalities and communities where they operate. This knowledge is further enhanced with our proprietary digital compliance data management tool, the market’s first digital platform for aggregating, cataloging and monitoring customer compliance information. TruHorizon is a member of ISNetworld and the contractor prequalification company PICS, is PEC SafeLandUSA trained and meets all OSHA requirements including job-specific training. To impart this knowledge to our regional customers, we have established three dedicated environmental safety-training facilities in Weatherford, TX, Claysville, PA and Greeley, CO.